Through the power of social networking, I was recently asked to write a review for Canongate’s wonderful Meet at the Gate website. 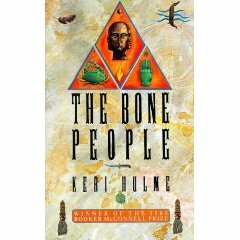 They are currently running a feature they’ve dubbed their Literature World Tour and when they posted on Facebook that their next stop would be New Zealand, I responded by saying that Keri Hulme’s The Bone People was one of my favourite books of all time. The next thing I know I’ve been messaged and asked to write a short review of it for the site. This meant that I had a valid reason, not that any were necessary, to re-read it. Now I was fortunate enough to come to this book without any preconceptions at all and no knowledge that it had been lauded and the recipient of book prizes such as the Pegasus Award and the Booker-McConnell as it then was. I was living in Athens, teaching English, in an apartment furnished from cast-offs I found in the street and didn’t have much money for luxuries such as books. So I swopped whatever books I managed to get hold of with my flatmate and vice versa. The Bone People was one of his and he desperately wanted me to love it as much as he did. Happily for house harmony, I did and still do. I am forever grateful that I found my way to Keri Hulme’s world and every so often take the opportunity to revisit. It is a magical, if ever so slightly disturbing, place. Sadly, I lost touch with my flatmate, but this book is one of the things that reminds me of him and for that I, too, am thankful. I visited your review at Meet at the Gate and you’ve reminded me what a good read The Bone People was. I shall now go away and reread – without any excuse at all. Love your website – the squirrel is hilarious – and re. your earlier post. I agree that can be difficult to get down to working from home, especially when there are blogs and Tweets to be read! I hope you enjoy re-reading The Bone People. I agree, it’s not a book you really need an excuse to revisit. Thanks for your feedback on the website but I assure you, the squirrel’s not always fun to be with!